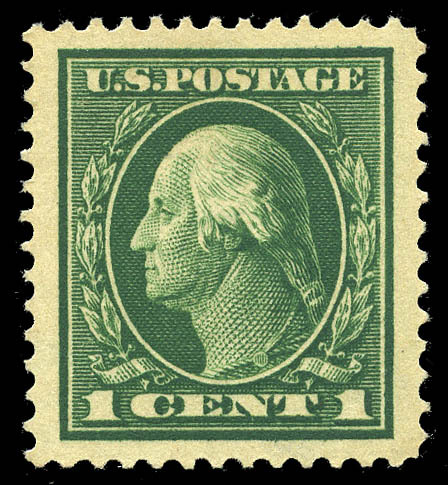 1912, 1¢ green (405), original gum never hinged, flawless centering in true jumbo margins, deep color. Superb, only seven at this grade and none higher. SMQ $500. Expertization: with 2000 P.F. certificate and 2007 P.S.E. certificate, the latter graded SUP 98J. 1912, 2¢ carmine (406), original gum never hinged, perfect centering, rich color. A Superb gem. SMQ $425. Expertization: with 2007 P.S.E. certificate graded SUP 98. 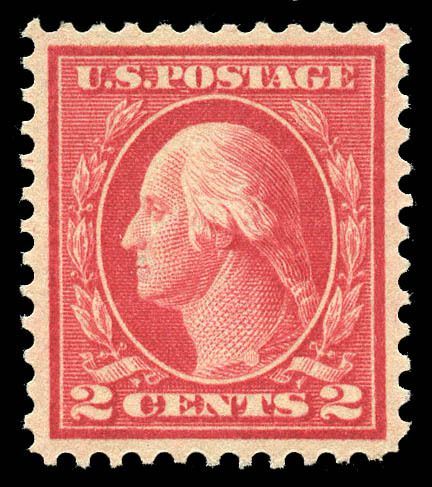 1912, 2¢ carmine, vertical coil (411), guide line pair, original gum never hinged, perfectly centered, intense shade. Superb, shares this grade with five others and only one higher (98J). SMQ $900. Expertization: with 1985, 1999 P.F. certificates and 2007 P.S.E. certificate, the last graded SUP 98. 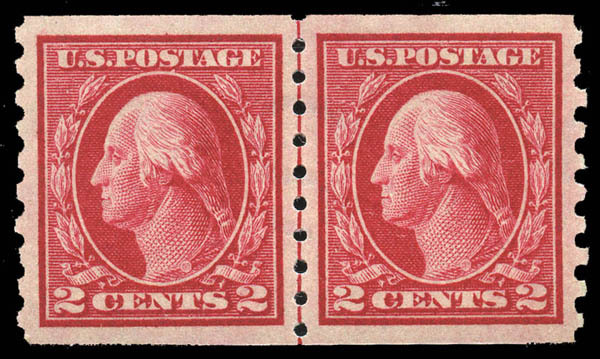 1912, 2¢ carmine, horizontal coil (413), guide line pair, original gum never hinged, flawless centering within wonderfully large margins (we are surprised this did not receive a "J" rating), prooflike color on the freshest of paper. Superb. SMQ $11,000. THE ULTIMATE QUALITY FOR A COIL LINE PAIR, ESPECIALLY ONE AS DIFFICULT TO LOCATE IN PREMIUM GRADES AS THE 2¢ 1912 PERF 8½ VERTICALLY. THE HIGHEST GRADED AND THE ONLY EXAMPLE AT THIS PRESTIGIOUS GRADE. Expertization: P.S.E. encapsulated Gem 100. 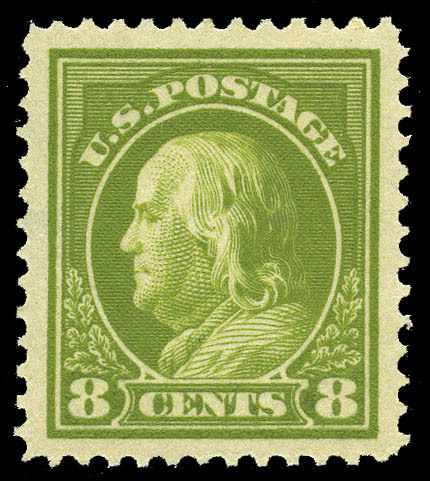 1912, 8¢ pale olive green (414), original gum never hinged, beautifully centered, huge balanced margins, brilliant color. Superb. SMQ $2,250. A SUPERB JUMBO GEM, WITH ONLY TWO GRADED HIGHER (100, 100J) AND ONLY THREE OTHERS AT THIS GRADE. Expertization: P.S.E. encapsulated SUP 98J. 1914, 9¢ salmon red (415), original gum never hinged, beautifully centered, gorgeous color. Extremely Fine, a very pretty stamp. SMQ $650. Expertization: with 2007 P.S.E. certificate graded XF-SUP 95. 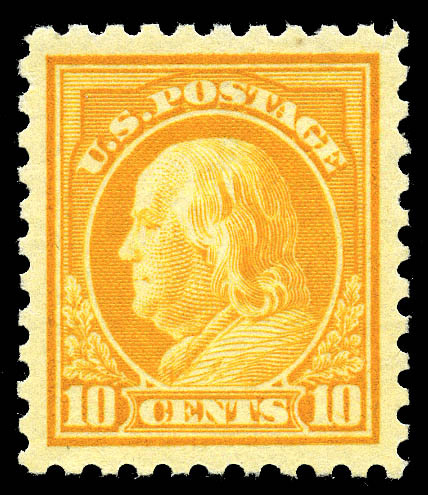 1912, 10¢ orange yellow (416), original gum never hinged, flawlessly centered within wide margins, vivid color. An Extremely Fine jumbo. SMQ $825. Expertization: with 2007 P.S.E. 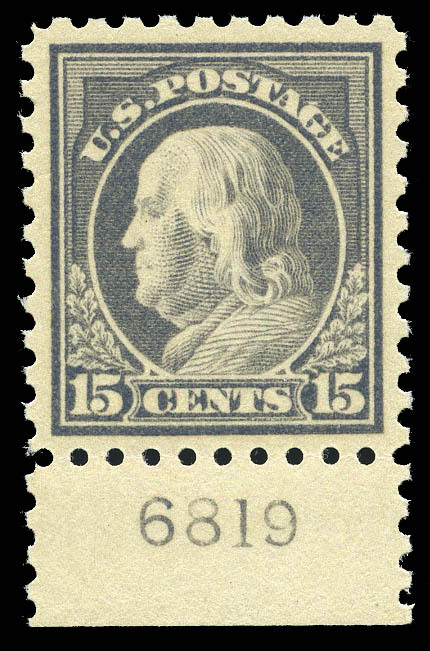 certificate graded XF-SUP 95J. 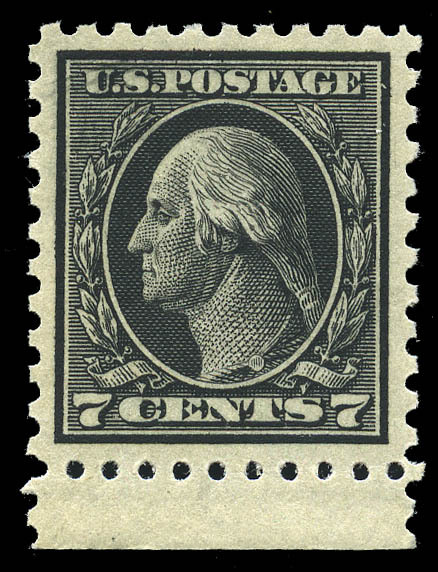 1912, 15¢ gray (418), original gum never hinged, perfect centering within unusually large margins, bright color. Extremely Fine, a choice jumbo. SMQ $1,100. Expertization: with 2000 P.F. certificate and 2007 P.S.E. certificate, the latter graded XF-SUP 95J. 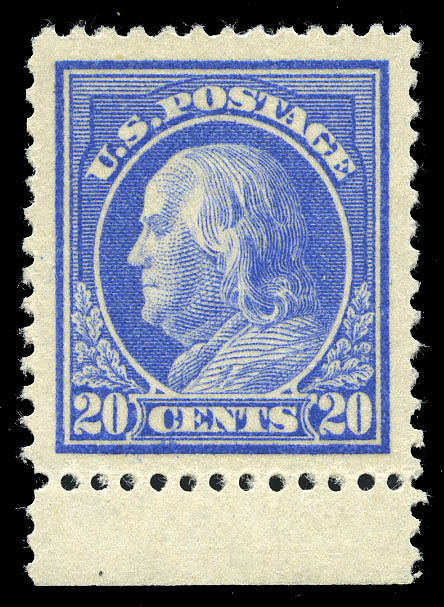 1914, 20¢ ultramarine (419), original gum never hinged, absolutely perfectly centered, prooflike color on bright paper. Superb. SMQ $8,350. A PERFECT GEM, THE HIGHEST GRADED AND THE ONLY ONE AT THIS LOFTY GRADE. Expertization: with 2000 P.F. certificate and 2013 P.S.E. certificate, the latter graded Gem 100. 1914, 20¢ ultramarine (419), bottom margin single, original gum never hinged, flawlessly centered within positively huge margins, stunning color. Superb, SMQ $5,750. A MAGNIFICENT JUMBO MARGINED 20¢ 1914, THE ONLY EXAMPLE AT THIS GRADE WITH ONLY ONE GRADED HIGHER (100). Expertization: with 2006 P.S.E. certificate graded SUP 98J. 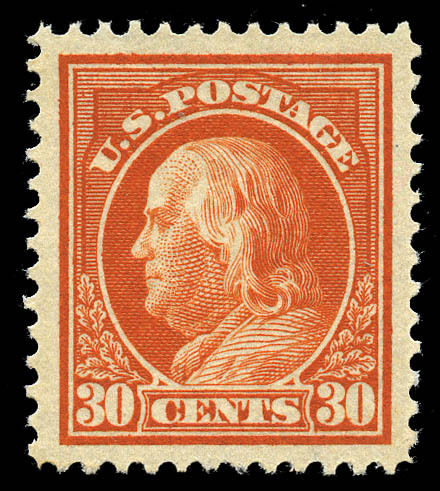 1914, 30¢ orange red (420), original gum never hinged, essentially perfectly centered within exceptionally large margins, brilliant rich color. Superb. SMQ $4,500. A WONDERFUL 30¢ 1914 WITH GREAT EYE APPEAL— ONLY ONE OTHER AT THIS GRADE AND ONLY TWO HIGHER (100). Expertization: with 1999 P.F. certificate and 2007 P.S.E. certificate, the latter graded SUP 98J. 1914, 50¢ violet, S.L. 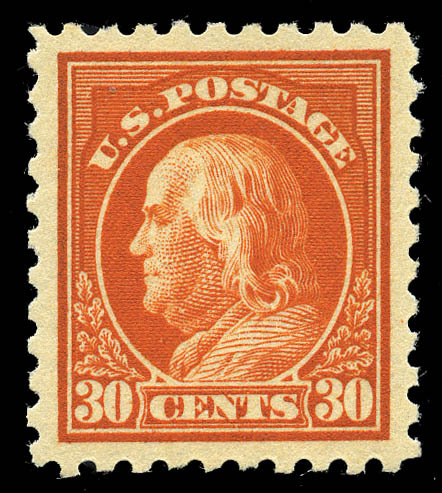 watermark (421), original gum never hinged, flawless centering, unusually large margins, vibrant color. An Extremely Fine gem. SMQ $4,500. 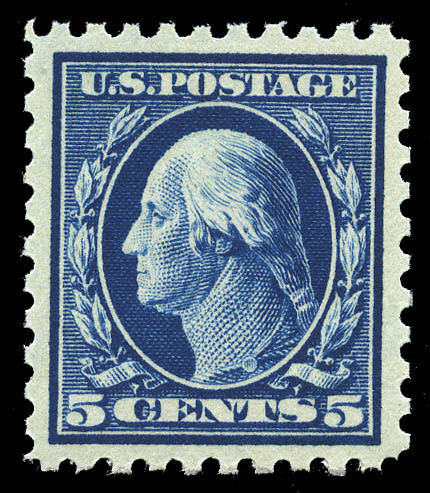 AN EXCEPTIONAL EXAMPLE OF THE ALWAYS DIFFICULT 1914 50¢, BEING ONE OF ONLY TWO AT THIS GRADE AND ONLY FOUR HIGHER, THERE ARE ONLY TWO OTHER EXAMPLES OF THIS STAMP WITH THE "J" DESIGNATION IN ANY GRADE. Expertization: with 1995 P.F. certificate (for block), 2002 P.F. certificate and 2007 P.S.E. certificate, the last graded XF-SUP 95J. 1912, 50¢ violet, D.L. watermark (422), top margin plate no. 5749 single, original gum never hinged, essentially perfectly centered, vivid color. Extremely Fine, choice plate no. single. SMQ $2,650. 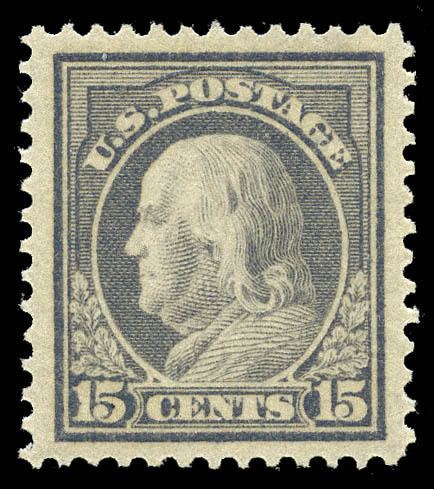 A DIFFICULT STAMP TO LOCATE IN THIS CHOICE CONDITION, SEVEN OTHERS SHARE THIS GRADE, ONLY ONE IS HIGHER (98). Expertization: with 2007 P.F. certificate and 2007 P.S.E. certificate, both graded XF-SUP 95. 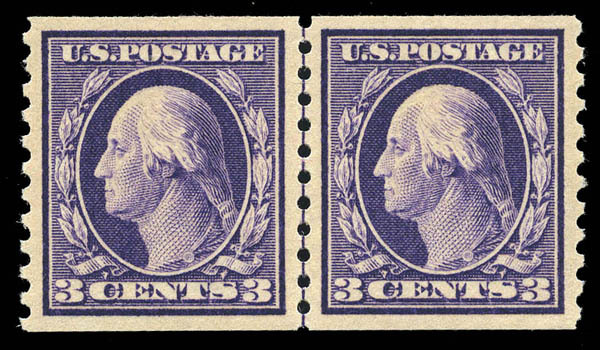 1912, $1 violet brown (423), original gum never hinged, precise centering within unusually large margins for the 1912 $1, rich color. Superb. SMQ $17,500. A TRULY EXCEPTIONAL EXAMPLE OF THIS HIGH VALUE, BEING THE ONLY ONE IN THIS GRADE AND WITH ONLY ONE GRADED HIGHER (98J). Expertization: with 2008 P.S.E. certificate graded SUP 98. 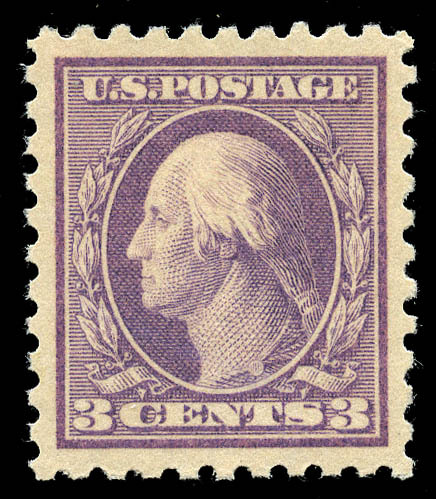 1914, 3¢ deep violet (426), original gum never hinged, in the striking "reddish violet" shade, perfectly centered within lavishly large margins. A Superb jumbo, only two others at this grade and only one higher (100J). SMQ $1,400. Expertization: with 1982 P.F. certificate and 2004 P.S.E. certificate, the latter graded SUP 98J (as "reddish violet"). 1914, 4¢ brown (427), original gum never hinged, perfectly centered within true jumbo margins, stunning color. Superb. SMQ $2,750. A PERFECT STAMP AND A JOY TO BEHOLD, THE HIGHEST GRADED MINT SINGLE WITH ONLY TWO OTHERS AT THIS GRADE. Expertization: with 1999 P.F. certificate and 2008 P.S.E. certificate, the latter graded SUP 98J. 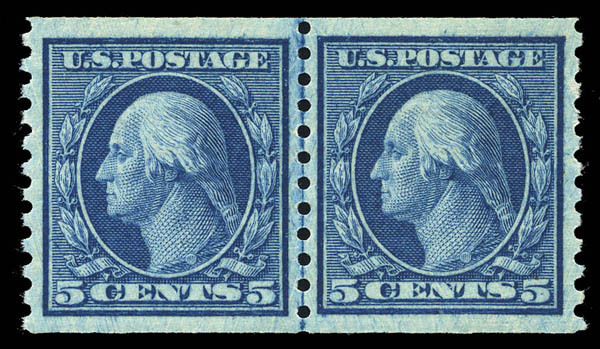 1914, 5¢ blue (428), original gum never hinged, perfect centering, intense color. Choice, Extremely Fine. SMQ $600. 1914, 6¢ red orange (429), original gum never hinged, flawless centering, rich color. Superb. SMQ $6,000. A GEM 6¢ 1914, THE HIGHEST GRADED AND SHARING THIS GRADE WITH ONLY TWO OTHERS. Expertization: with 1997 P.F. certificate and 2009 P.S.E. certificate, the latter graded Gem 100. 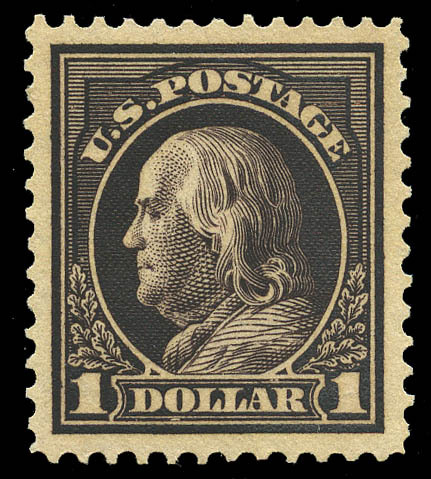 1914, 7¢ black (430), bottom margin single, original gum never hinged, choice centering, intense color. An Extremely Fine gem. SMQ $1,350. 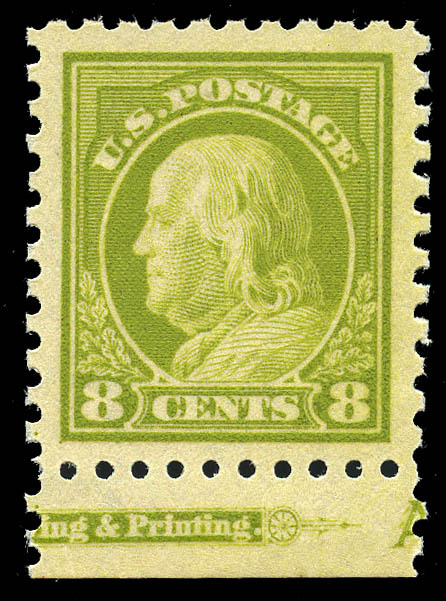 1914, 8¢ pale olive green (431), bottom margin single with imprint, original gum never hinged, virtually perfectly centered within exceptionally large margins, bright color. Superb. SMQ $2,500. A TRUE JUMBO 8¢ 1914, AND THE HIGHEST GRADED WITH ONLY ONE OTHER AT THIS GRADE. Expertization: with 2004 P.F. certificate for plate number strip and 2008 P.S.E. certificate, the latter graded SUP 98J. 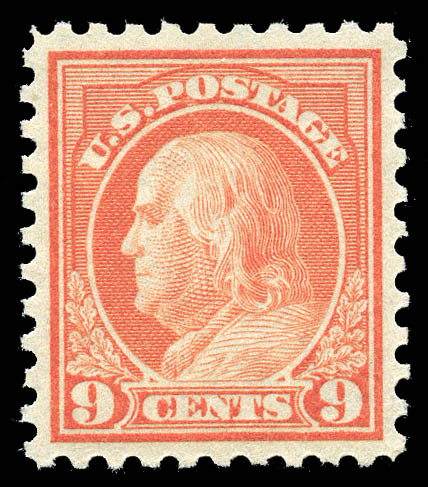 1914, 9¢ salmon red (432), original gum never hinged, excellent centering, vivid color. Extremely Fine, choice. SMQ $750. Expertization: with 2003 P.F. certificate and 2005, 2007 P.S.E. certificates, last two graded XF-SUP 95. 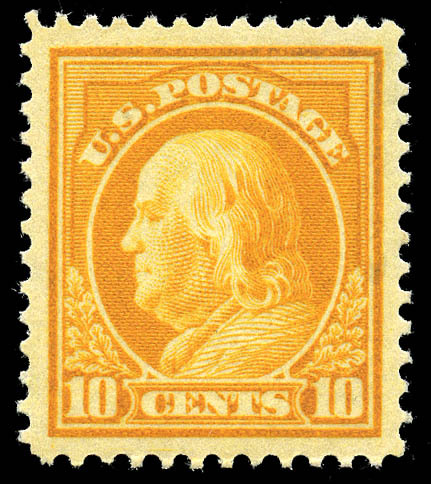 1914, 10¢ orange yellow (433), original gum never hinged, absolutely perfectly centered within wide perfectly balanced margins, incredible rich color. Superb, unpriced in 100J, SMQ for regular 100, $5,800. THE EPITOME OF A GEM WASHINGTON-FRANKLIN, PURE PERFECTION, THE HIGHEST GRADED EXAMPLE AND THE ONLY ONE AT THIS TOP GRADE WITH ONE OF LITLE'S INIMITABLE POST-ITS "THE FIRST 100J 433 HIGHEST GRADE". IT IS STILL THE ONLY! Expertization: with 2009 P.S.E. certificate graded Gem 100J. 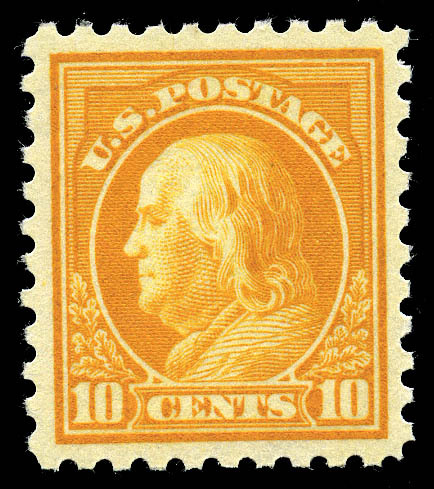 1914, 10¢ orange yellow (433), original gum never hinged, wonderfully well centered, vibrant rich color. Superb. SMQ $2,450. A stunning 10¢ 1914, with only 2 graded higher (100, 100J). 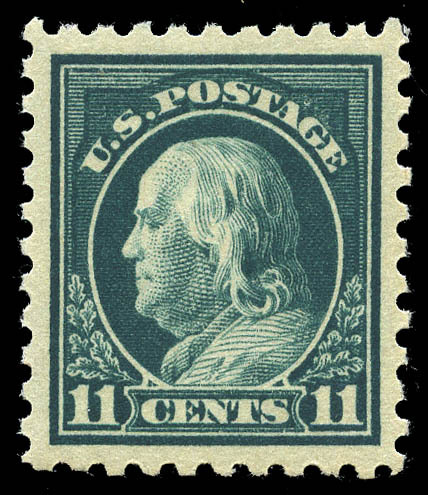 1915, 11¢ dark green (434), original gum never hinged, choice centering, gorgeous color. Superb, only four higher (three 98J, one 100). SMQ $1,100. Expertization: with 2000 P.F. certificate and 2007 P.S.E. certificate, the latter graded SUP 98. 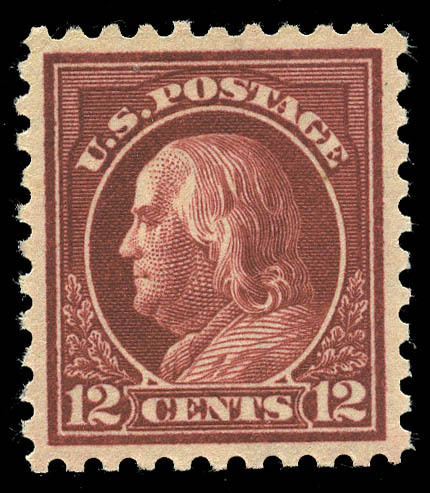 1914, 12¢ claret brown (435), original gum never hinged, virtually perfectly centered, brilliant color. An Extremely Fine gem. SMQ $475. Expertization: with 1989 P.F. certificate and 2007 P.S.E. certificate, the latter graded XF-SUP 95. 1914, 15¢ gray (437), bottom margin single with plate no. 6819, original gum never hinged, wonderfully well centered, exceptionally fresh. Extremely Fine, choice. SMQ $1,700. Expertization: with 1998 P.F. certificate and 2007 P.S.E. certificate, the latter graded XF-SUP 95. 1914, 20¢ ultramarine (438), original gum never hinged, essentially perfect centering, post office fresh, with brilliant color. Simply Superb. SMQ $6,150. A SUPERB MINT SINGLE OF THE 20¢ 1914, WITH ONLY SIX OTHERS AT THIS GRADE AND ONLY ONE HIGHER (100). Expertization: with 2005 P.F. certificate and 2006 P.S.E. certificate, the latter graded SUP 98. 1914, 30¢ orange red (439), original gum never hinged, basically perfectly centered within unusually large margins, luminous rich color. An Extremely Fine jumbo. SMQ $4,250. 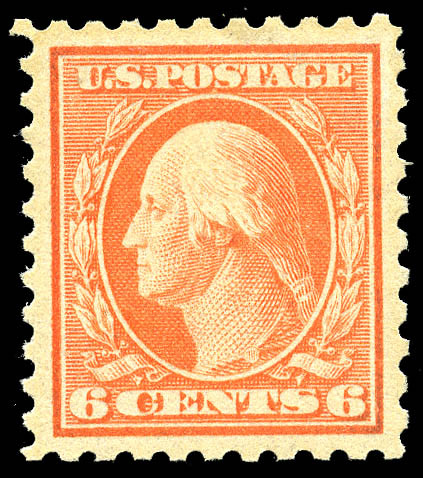 A CHOICE MINT SINGLE, WITH ONLY THREE OTHERS AT THIS GRADE AND ONLY TWO HIGHER (98). Expertization: with 2008 P.S.E. certificate graded XF-SUP 95J. 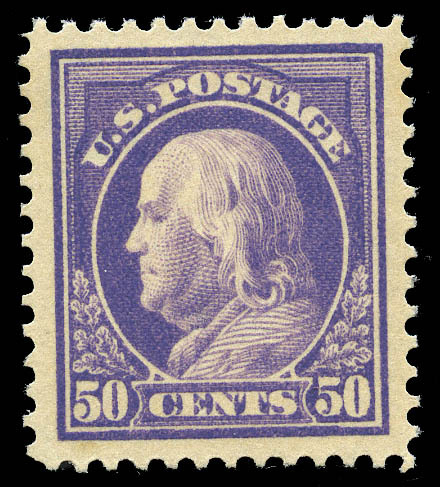 1915, 50¢ violet (440), original gum never hinged, near perfect centering, brilliant color. A Superb high value. SMQ $12,000. AN EXCEPTIONAL MINT SINGLE OF THE 50¢ 1915 ISSUE, BEING ONE OF ONLY SEVEN AT THIS GRADE AND ONLY ONE GRADED HIGHER (100). Expertization: with 1993, 2003 P.F. certificates and 2005 P.S.E. certificate, the last graded SUP 98. 1914, 1¢ green, vertical flat plate coil (441), guide line pair, original gum never hinged. Superb, a perfect pair, only two graded higher (100J). SMQ $750. Expertization: with 2006 P.S.E. certificate graded Gem 100. 1914, 2¢ carmine, vertical flat plate coil (442), guide line pair, original gum never hinged, perfectly centered. Extremely Fine, only three higher (only one 100). SMQ $650. Expertization: with 1996 P.F. certificate and 2006 P.S.E. certificate, the latter graded XF-SUP 95. 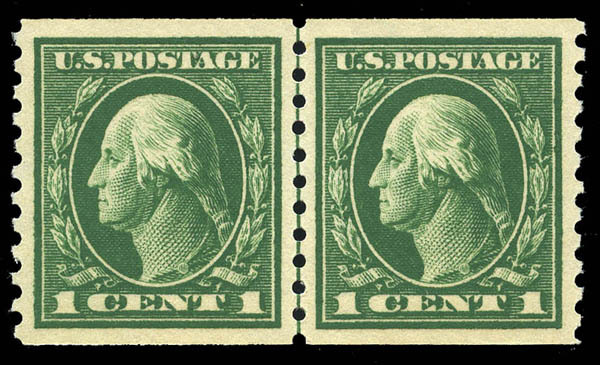 1914, 1¢ green, horizontal flat plate coil (443), pair, original gum never hinged, post office fresh. Superb, only two others at this grade, none higher. SMQ $1,000. 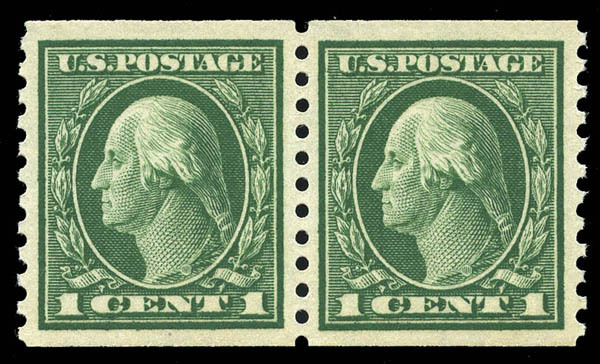 1914, 1¢ green, horizontal flat plate coil (443), guide line pair, original gum never hinged, perfect centered within perfectly balanced margins, prooflike color. Superb. SMQ $4,100. A SUPERB LINE PAIR, BEING THE HIGHEST GRADED LINE PAIR, THE ONLY ONE AT THIS GRADE. INTERESTINGLY THERE ARE VERY FEW LINE PAIRS AT THE 95 & 98 LEVEL. Expertization: with 2008 P.S.E. certificate graded Gem 100. 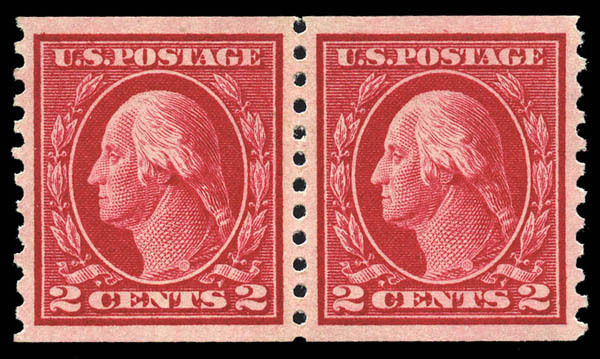 1914, 2¢ carmine, horizontal flat plate coil (444), pair, original gum very lightly hinged, absolutely perfectly centered, rich color. Superb, only one other at this grade, no never hinged at this grade. SMQ $900. Expertization: with 1997 P.F. certificate and 2007 P.S.E. certificate, the latter graded Gem 100. 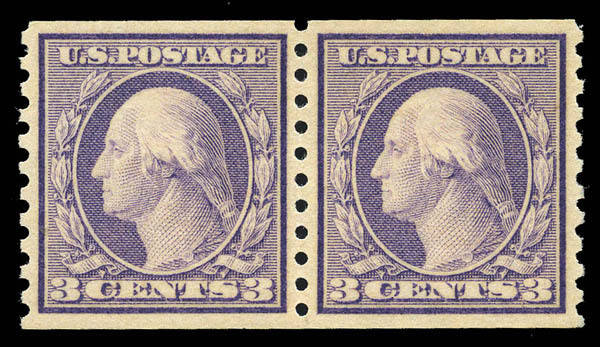 1914, 3¢ violet, horizontal flat plate coil (445), guide line pair, original gum never hinged perfectly centered, rich color. Superb. SMQ $15,000. 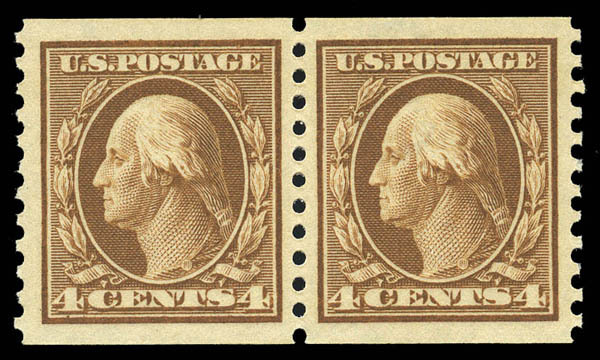 AN INCOMPARABLE GUIDE LINE PAIR WHICH IS ALWAYS DIFFICULT TO LOCATE IN TOP GRADES (ONLY SEVEN HAVE BEEN GRADED 90 OR ABOVE), THIS IS THE HIGHEST GRADED EXAMPLE AND SHARES THIS TOP GRADE WITH ONLY ONE OTHER. Expertization: with 2010 P.S.E. certificate graded SUP 98. 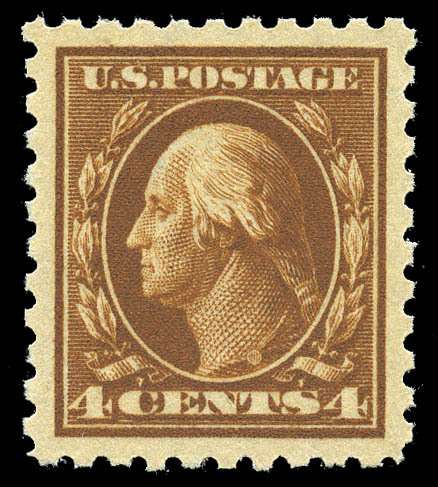 1914, 4¢ brown, horizontal flat plate coil (446), original gum never hinged, perfectly centered within huge margins, brilliant color. Superb. SMQ $7,000. AN ABSOLUTELY CHOICE PAIR, WITH ONLY ONE OTHER AT THIS GRADE AND ONLY THREE HIGHER. Expertization: with 1995, 2003 P.F. certificates and 2007 P.S.E. certificate, the last graded SUP 98J. 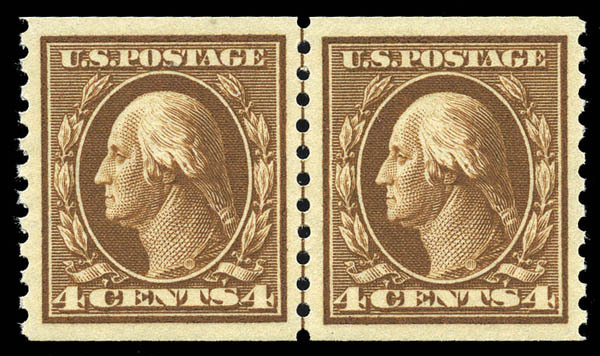 1914, 4¢ brown, horizontal flat plate coil (446), guide line pair, original gum never hinged, perfectly centered within wide margins, prooflike color. Extremely Fine, an absolutely superb line pair, only two graded higher (98) with four others sharing this grade. SMQ $4000. Expertization: with 1982 P.F. certificate (for line strip) and 2018 PSE certificate, latter graded XF-SUP 95. 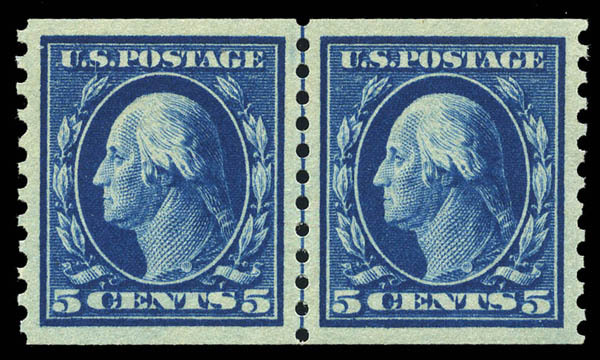 1914, 5¢ blue, horizontal flat plate coil (447), pair, original gum never hinged, virtually perfectly centered, brilliant color and paper. Extremely Fine, only four graded higher and six others at this grade. SMQ $775. Expertization: with 2000 P.F. certificate and 2007 P.S.E. certificate, the latter graded XF-SUP 95. 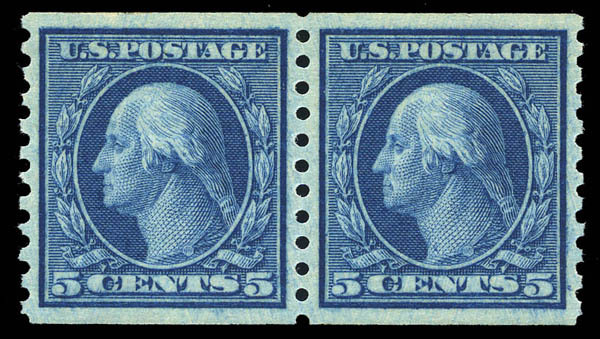 1914, 5¢ blue, horizontal flat plate coil (447), guide line pair, original gum never hinged, absolutely perfectly centered within very wide margins, fresh intense color. Superb. SMQ $8,000. A PERFECT GUIDE LINE PAIR AND THE HIGHEST GRADED, SHARING THAT DISTINCTION WITH ONLY ONE OTHER. Expertization: with 1999 P.F. certificate and 2007 P.S.E. certificate, the latter graded Gem 100. 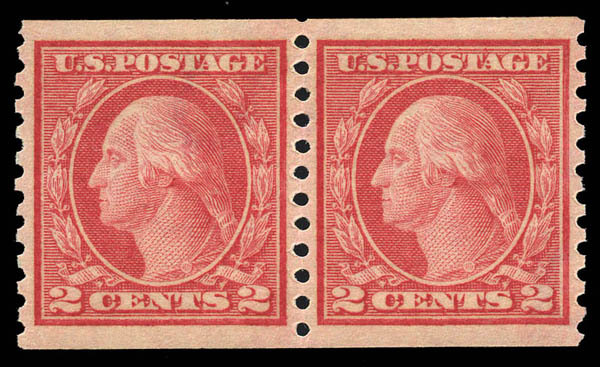 1916, 2¢ carmine, type III, vertical rotary coil (450), joint line pair, original gum never hinged, well centered and fresh. Very Fine. SMQ $550. Expertization: with 1999 P.F. certificate and 2008 P.S.E. certificate, the latter graded VF 80. 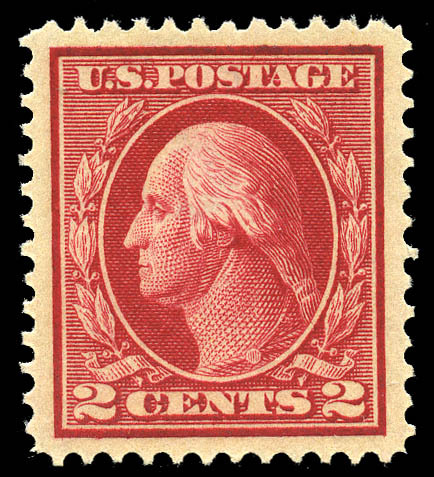 1915, 2¢ red, type II, horizontal rotary coil (454), pair, original gum never hinged, flawless centering, huge top and bottom margins. Superb. SMQ $3,100. AN EYE CATCHING JUMBO MARGINED PAIR, AND THE HIGHEST GRADED, SHARING THE TOP GRADE WITH ONLY TWO OTHERS. Expertization: with 2008 P.S.E. certificate graded SUP 98J. 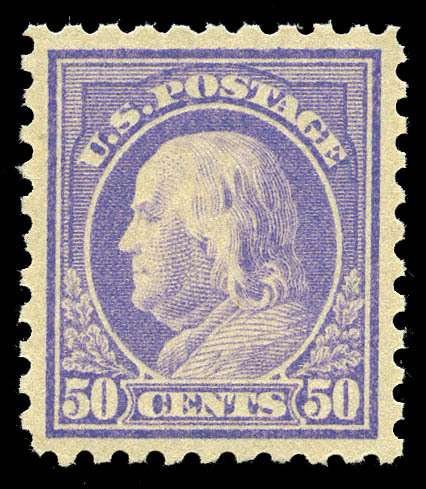 1916, 3¢ violet, horizontal rotary coil (456), pair, original gum never hinged, perfectly centered, bright color. Superb. SMQ $6,750. ALWAYS A DIFFICULT PAIR TO LOCATED IN PRIME NH CONDITION, THIS PAIR IS SIMPLY PERFECT, AND ALSO THE HIGHEST RATED, SHARING THAT DISTINCTION WITH ONLY TWO OTHERS. 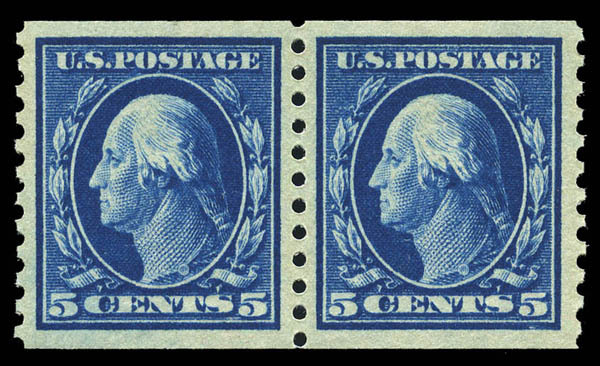 1916, 5¢ blue, horizontal rotary coil (458), pair,original gum never hinged, perfectly centered, beautiful rich color. Superb, the highest rated with only five others at this grade. SMQ $925. Expertization: with 2004 P.F. certificate and 2007 P.S.E. certificate, the latter graded SUP 98. 1916, 5¢ blue, horizontal rotary coil (458), joint line pair, original gum never hinged, essentially perfectly centered, post office fresh, rich color. Extremely Fine, only four graded higher. SMQ $1,100. Expertization: with 2007 P.F. certificate and 2007 P.S.E. certificate, the latter graded XF-SUP 95. 1915, 2¢ pale carmine red, S.L. watermark, perf 11 (461), original gum never hinged, beautifully centered, post office fresh. Extremely Fine, scarce in this premium condition. Only 3 graded higher (95J and two at 98) SMQ $2,000. Expertization: with 1981 P.F. certificate and 2008 PSE certificate, latter graded XF-SUP 95.